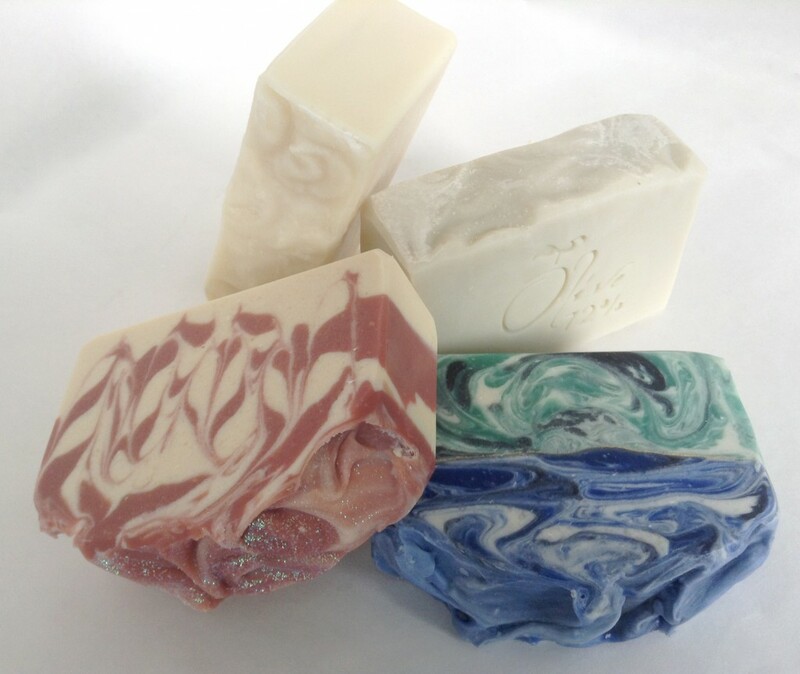 New England Handmade Artisan Soaps – Use handmade. Your skin deserves it. 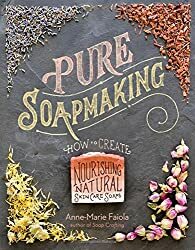 I truly have been enjoying inspiration from Anne-Marie Faiola’s Pure Soapmaking: How to Create Nourishing, Natural Skin Care Soaps, which I reviewed recently on this blog. I have also enjoyed watching other soapmakers experiment with Anne-Marie’s ideas and recipes from the book. 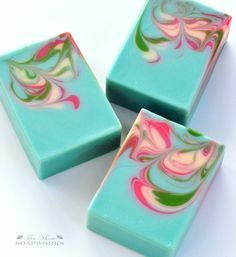 I spent a few minutes today watching soapers try Anne-Marie’s recipe for an Aloe Vera Hanger Swirl soap as shown on pp. 177-181 in the book. I admit to being drawn to that soap as well. 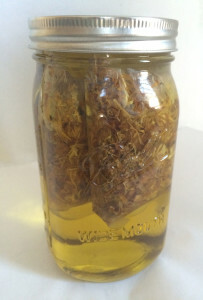 First up, I watched the wonderful Holly of Missouri River Soap try out the recipe with her own tweaks—she uses different oils— and a slightly different technique. Next, I watched the incomparable Zahida Map of Handmade in Florida give the recipe her own flair. Both of these women are talented soapmakers whom I admire a great deal. Watching these videos made me anxious to give this soap a go. 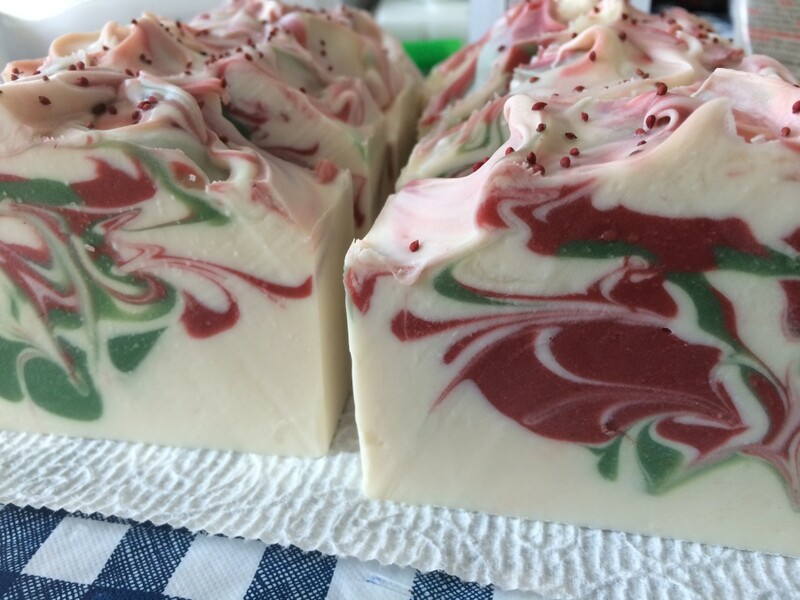 Like Holly, I used my own soap recipe. 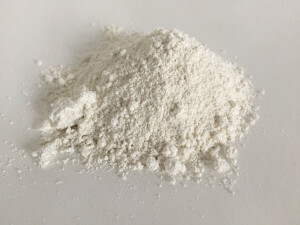 Holly is absolutely right in that as you become a more experienced soapmaker, you come to formulate your own recipe that you like. You know how it will behave under normal conditions, and you know how it will feel to use, what the lather will be like, and what its various properties will be. 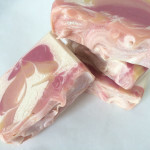 I experimented quite a lot with a variety of recipes, but I have gradually settled on one recipe that is my mainstay for almost all of my soaps now. I used the same colors as Anne-Marie in her book: chromium oxide, hydrated chromium green oxide, and titanium dioxide. I didn’t have any aloe vera leaf or gel or any cedarwood essential oil. Anne-Marie (and Holly and Zahida) used the lavender and cedarwood essential oil combination, which I’m sure smells divine. In fact, I’m kind of wondering if it smells like Bramble Berry’s Lavender & Cedar fragrance oil. I bought some Green Irish Tweed fragrance by BeScented from a friend recently, and I had been wanting to try it. This technique of Anne-Marie’s looked like a good opportunity. 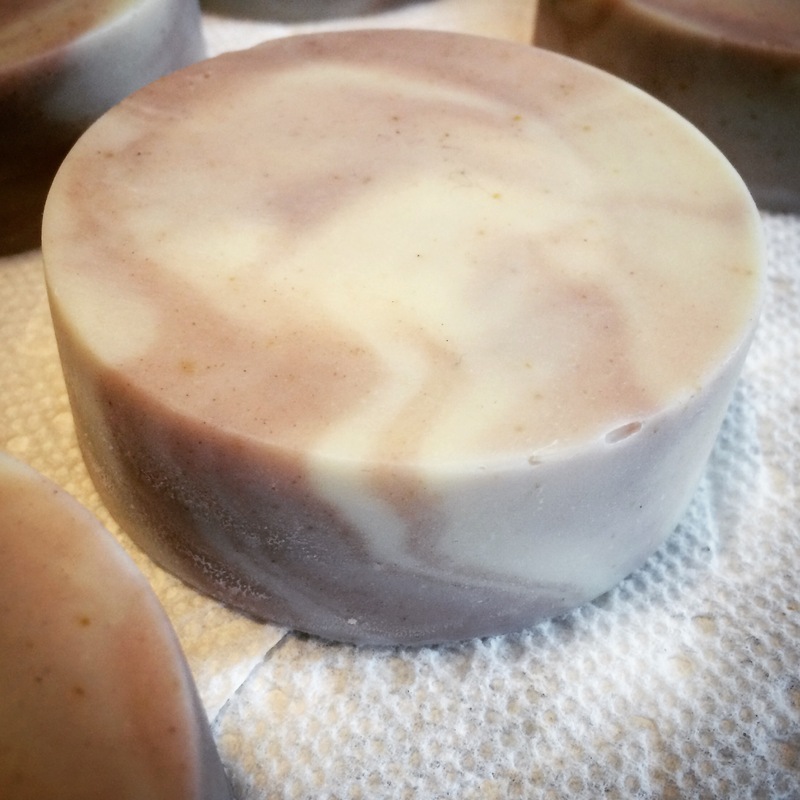 Aside from using my own oil recipe, changing up the fragrance, and deleting the aloe vera leaf/gel, I basically followed Anne-Marie’s advice, with the exception of not spooning the soap into the mold. Like Holly, I opted to pour at thinner trace so that I could get more swirls. I used aloe vera liquid at perhaps just a bit more than the amount Anne-Marie did. I divided the soap, but not into precise thirds. 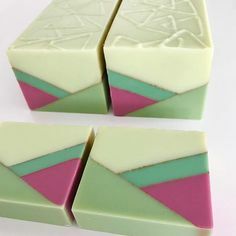 I have a 3.5-4-pound mold, and I poured about 1.5 cups of soap into two measuring cups for each of the greens and colored the rest of the soap white. 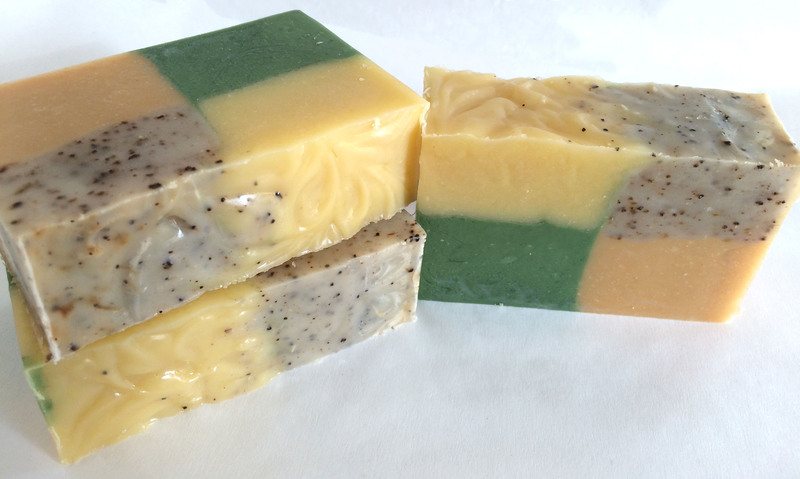 I find that I like the way my soaps look better if they have more white rather than equal numbers of each color. The Green Irish Tweed fragrance doesn’t accelerate, and even though it looks a like it’s a bit dark in the bottle, it doesn’t seem to discolor. 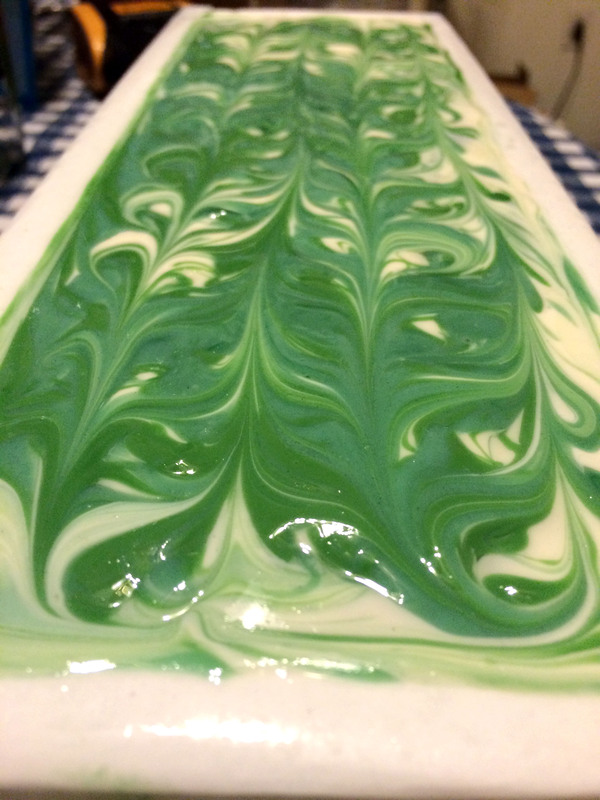 I poured a layer of white soap and then swirled in each of the greens, very similar to the way Holly did in her video. I repeated until most of the soap was gone. I kept some to do a swirly top. I used my new hanger swirl tool (man, did that make this easier!) 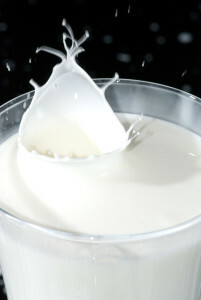 to add the hanger swirl. 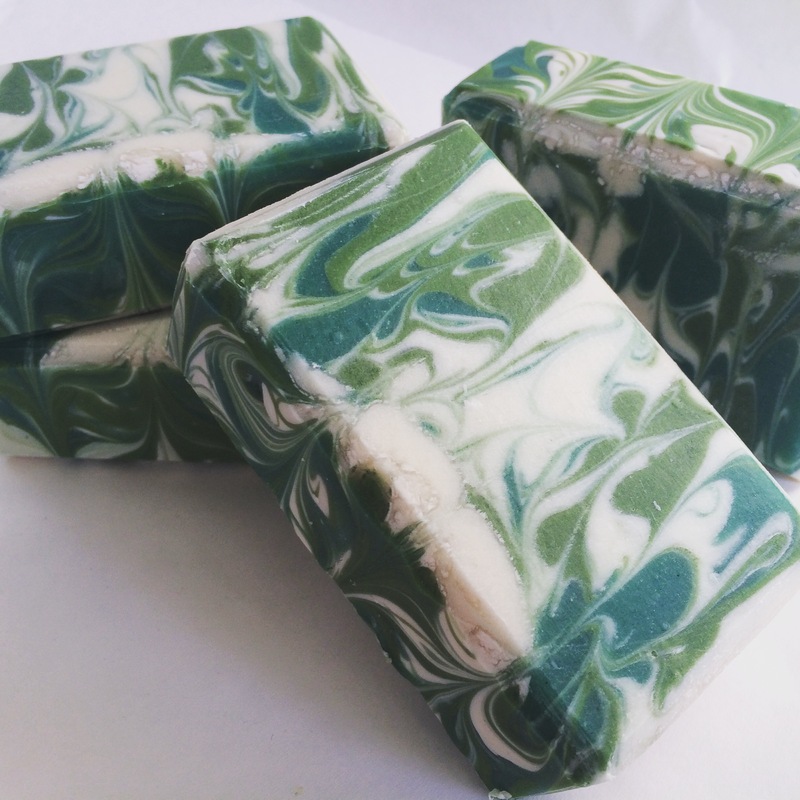 Based on suggestions from Twitter and Instagram friends of New England Handmade Artisan Soaps, I’ve decided to call this soap Emerald Isle. Isn’t it beautiful? And it smells absolutely divine. I haven’t ever smelled Green Irish Tweed by Creed, but it reminds me a bit of Irish Spring. I am definitely sending some along to my daughter, who loves fresh unisex scents like this one. I’m really happy with how it turned out. I am using a new brand of titanium dioxide, and I noticed some fine dots near the tops of the bars. I’m not sure if it’s something like glycerine rivers. You can probably see the dots in the image above. It’s funny, but I might have been really disappointed about those white dots in the past, but over time I have come to accept that sometimes titanium dioxide does funny things, and you just have to roll with it. 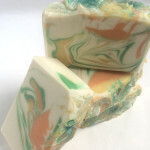 I’m not sure why the titanium dioxide would only be temperamental at the top of the soaps because my experience with glycerine rivers is that they are usually threaded throughout the soap and are less prominent, if anything, at the tops. In any case, the greens really popped after gelling. 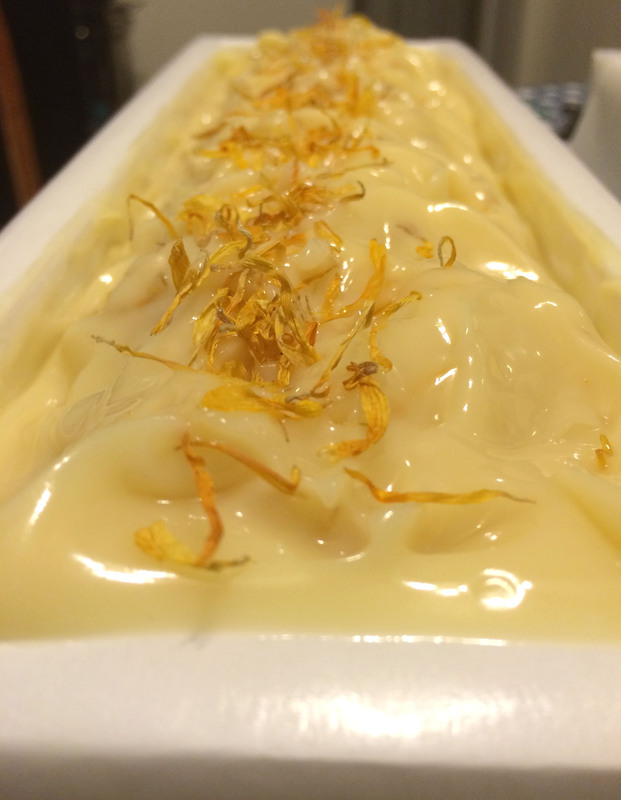 Recently, I also tried Anne-Marie’s recipe for Oatmeal Soap for Babies on pp. 78-81. 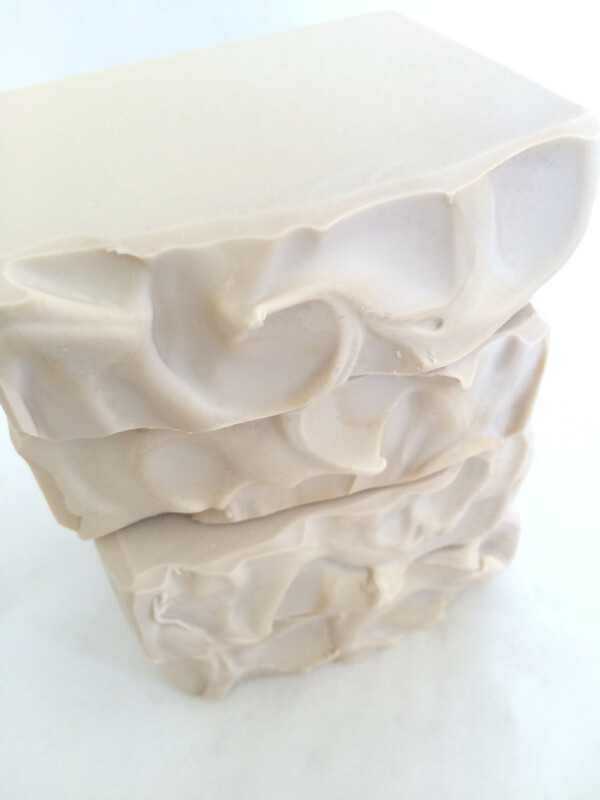 I used her exact recipe, though sized for six bars in my round silicone mold. 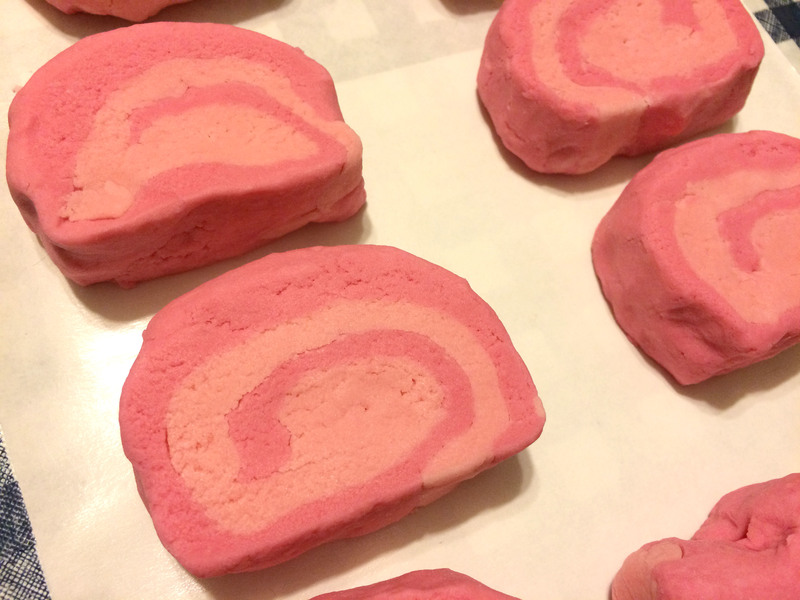 I also opted to swirl with purple Brazilian clay, so I didn’t add bentonite clay to the whole batch—just the uncolored half. 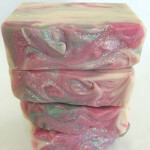 I added lavender essential oil to the soap. Aside from these adjustments, my soap was made with the same recipe as Anne-Marie’s. 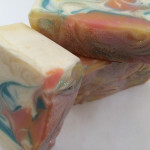 I should mention that I don’t really make a clay slurry, either with oils or water, when I use clays in my soap. I just add the clay right to my oils before I add the lye water. I have never had any issues with clay when I have added it in this way, but I have had issues when I have added clay as a slurry. Go figure. Babies could likely still use this soap, even with the lavender essential oil added, but I plan to suggest it for people with sensitive skin who want to use a gentle, natural soap. I have to recommend Anne-Marie’s book again. I think beginners will find a great deal of information in it, and so will advanced soapers. After working with a shop through this site for nearly year, I have decided that I will be using Etsy exclusively to sell my products. Etsy seems to work better and is easier for my customers, and I know it works better and is easier for me. Working with my own shopfront has been an interesting learning experience. Everything I have learned has only affirmed for me that I will better serve my customers on Etsy. You should see the changes taking effect here on the site shortly. I will still be blogging here and making YouTube videos when I can. I’m not really going anywhere. I’m just streamlining a bit and making things a bit easier all the way around. Thanks to those of you who joined me in my experiment. See you in the Etsy store, I hope.